One thing you can count on in Brazeau is that you’ll have a blast at the dinner ride, really enjoy the club banquet, and you’ll stand the chance of winning amazing raffle prizes while having a great time filled with laughs. The Bagley & Brazeau Club is a member of the AWSC, which stands for the Association of Wisconsin Snowmobile Club, which also services well over six-hundred other clubs. The club is located near Oconto Country and maintains more than 98 miles of trials both in Marinette County and Oconto County. The trails run from the north all the way to the south, starting from the White Potato Lake area right through to the Kelly or Suring Lake area. It covers all the townships of Suring, Maple Valley, Bagley and Brazeau and volunteering members put in hundreds of hours a year to keep the trails in pristine condition. Club officers keep the club functional and organised while some of the members maintain the equipment. Club meeting takes place on a monthly basis from around September to April at some of the restaurants and taverns in the area that also sponsors the club. While everyone lends a hand in the upkeep of the club, there is plenty of time to play, and the Joyriders have lots to look forward to in terms of club events taking place throughout the year. New members are always welcome to join the club once knew as the Bag and Bra Joyriders. 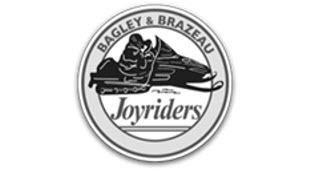 The Bagley & Brazeau Club started in 1970 and was formed by a group of individuals who had a common love and interest in snowmobiling. During 1987 up to 1988 season, the club became a member of the AWSC and became incorporated. Throughout its years in existence, the trail systems have enjoyed many upgrades and transformed from non-groomed trails to the splendid 98 miles of exceptionally wide trails now available to all club members. The trail system started by cutting down several trees and continues to be exceptional due to the maintenance offered via several members. Every year the club improves as new members come with new suggestions, while others remain loyal for years and during the early 70s the right of way agreement protects all the landowners, should any legal claims ever rise from an accident. New negotiations take place yearly between the club and the landowners to ensure everyone is happy with the conditions. Over 20 years ago the club purchased its tractor, the private purchase was funded by a couple of the members, and with the lease of an additional tractor, it is much easier to maintain the trails and enjoy more playtime. The yearly highlight remains the dinner ride, the raffle and the club banquet which offers the club the opportunity to collect additional funding via the raffles and to relax in the great company of all attendees and club members.